Drew McLellan drew my attention to this wonderful post on what happens to the big brands during the recession, have a quick look. Blogapalooza 2008: looking back to go forward. Like last year, Robert Hruzek over at Middle Zone Musings is inviting us to submit 12 blog-post (one per month) of 2008. It’s becoming one of those traditions really. And a good tradition it is too. Nothing gets the mind focused forward than looking back I’ve learned. 2008 was truly an exciting year: the 5th Anniversary of Wood You Like, the end of the housing boom, the banking crash, the ‘credit crunch’, the tremendous drop of the stock-exchanges, the ‘banking rescue’ plans and at the end the free-fall of the pound. Great tidings when you are in a business related to the housing market. 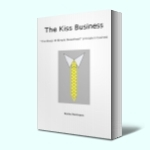 This year my selection of Kiss2 blog-post centres around keeping our business on track, one way or the other – which we did, although behind on last year’s great result our books also show a profit for this year. Main trick: we never wavered from our hedge-hog concept, simple but effective. Even when you run a one-man-and-one-woman business you need a team of experts to make the best of everything. ‘Our team’ of experts brought together one of our most talked about marketing efforts, The Acorn. So, thanks again Richard and Danny. I love AWeber – that’s by now a known fact – and even more so when I discovered that a simple submit form could do so much more to start a two-way conversation with a prospect. Social media, progress in technology. Not always needed in business conversations. One of my pet-hates in regards of most business advice books: they all forget about one type of business. Still plan to write a book about it that does cover advice for these businesses – we’re one of them. May: Common human reaction or common sense? When the so-called "credit crunch" started to bite and a new media hype was born. Still no such thing as a free lunch in my book. Two reasons for selecting this post for July: it was Kiss2 200th post and a reflection on the first 6 months of troublesome 2008. Where last year I wrote plenty of book reviews, this year I seemed to have read only. Jon’s book stands out miles above most “copy-writing for SEO” books, getting the mix between the two of them precisely right – for any business. October: Why don’t I hear from them? My thoughts on spending a meagre 27 pence to gain more business and why most small businesses still seem to find that a too high a price – weird! An example (true to the tag-line of my newest blog) of how combing various software programs can turn any product into a digital one. I’ve listed all the simple but very effective programs (or training courses) we used to turn wood digital. Although December became a banking mystery month I decide to select this post because it is such a basic, simple and effective principle. Not just in business, in life too. 2009 promises to be even more exiting! Over the Christmas period I’ve written our business plan for next year, just stay tuned here for all marketing projects we’re putting in the pipe-line. Overall thought: I still have the best job in the world! Wishing you a Happy, peaceful and prosperous New Year! It has been over 18 months since I even visited a bank branch, cheques are paid in into another bank (one that doesn't charge for this), any moneys coming in to this 'full of mysteries' bank are either through PDQ machines (off line and online) or BAC's - never ever do we pay in cheques or cash over this bank's counter. So, on the phone again - as I did twice before, yes I know, I am a penny pincher! - and after waiting for around 3 - 4 minutes the person at the other end of the line first questioned me about paying in cheques or cash etc over the counter, then mentioned something about perhaps it being refunds that were listed in their system as 'Credits Paid In'. I was told - as I've been twice before - the local bank manager would have to look in to it and I would be contacted again. The first time - 6 months ago - I questioned the mysteries £ 3.00 charge I was never called back, the second time - three months ago - the £ 3.00 were credited to our account without any explanation and now I'm still waiting for a reply. Think this time I better follow up with a letter, too many mysteries happening. And if anything, the mysteries are very constant! I'm now also wondering if the 'wandering' pound every month has anything to do with it? When it comes back home safely does it have to pay a fee to enter 'home' again? Mysterious! Anyway, Merry Christmas and a Happy and prosperous New Year! Like the UK and other European countries The Dutch government introduced (since July 08) a smoking ban in all public areas - apparently. We - marketers - know and realise that those businesses who listen to the needs and wants of their clients are those businesses that will stay in business. The Dutch population said no to the smoking ban: we will/can decide for ourselves how we want to live, knowing fully well the possible consequences of some of our 'vices'. Pub owners (cafe and 'kroeg' owners) listened to their clients and en mass the smoking ban is ignored. Most pubs have 'piggy banks' on the counter where smokers are more than willing to 'donate' a small fee in exchange for an ash tray - to contribute to a possible fee the pub owner is facing when 'caught in the act of allowing clients to smoke inside - civil disobedience at work. If only UK pub-owners would do the same, then perhaps 70 public houses per week wouldn't go out of business. Annual pre-Christmas break or annual work-holiday? This is really starting to become a tradition: pre-Christmas break - a few days 'back-home' for annual family dinners and, since we're over there any way, visiting some of our suppliers. That's what we will be doing this coming week: we're off to The Netherlands tomorrow (Friday 12 Dec) and back home in Charing Friday 19 Dec late afternoon. That's 8 whole days! The weather forecast it cold, clear and sunny - hurray, more signs of a real holiday (the clear and sunny bit I mean). The only thing my partner allows me to take with me that vaguely relates to work is: a notebook and a pen ;-) (Oh, and my camera to take pictures in the Design Parquet factory of course). Back soon - holiday days seem to fly even faster than normal days. When you are a bookkeeper (and a double Capricorn!) like me you have the habit of checking your online bank accounts daily. I do, business wise as well as personal accounts. This way I keep a close check on the cash-flow, very important responsibility when being in business. Now, some time last year I noticed there was a 1 pound difference between the balance and 'currently cleared balance' on one of our business bank accounts. There can be a difference between the two when we have paid something by debit card that normally takes two - three days to appear on the balance, but is deducted from the currently cleared balance - available moneys so to say. But in this case I knew there wasn't a £ 1.00 due anywhere. So I called my bank and told them one of my pounds had gone 'walk-abouts'. They would look into it. 15 minutes later they informed me there was nothing they could see and that I shouldn't worry: that little pound would surely come back safely home soon. Which it did; two days later. Almost every month I notice the same: at one point one of our pounds goes 'walk-about' and returns home safely two - three days later. Weird! Does that happen only to our account? Imagine being able to borrow one single pound (who would miss it?) from all your clients - 100.000, 500.000, a million clients? - just for a few days to 'play with'. What could you generate in profit from it? Borrowed without consent - like my school friend used to do with my push-bike all those years ago. She took mine because hers was at the back of the stack and I 'didn't need it at that time'. I did 15 minutes later and had to walk! Frustrating! I know it's just 1 pound that always "materialises" again, but still: it irks me. I truly don't like mysteries of the financial kind. Most of yesterday I was 'free-wheeling', reading blogpost and comments (here and there). Two remarks got connected: I re-read a principle Liz Strauss mentioned - oh must be almost a year ago, and I followed a link from a comment Ricardo Bueno left here - oh must be almost a year ago - and landed on his latest post about what you do if a blogger doesn't reply to your comment. The principle: IST = It's So Tiny. replying to someone's comment on your own blog - after they have taken the time and effort to read and respond to your thoughts or asked you a question, how long does it really take to acknowledge their presence, answer their question and start a conversation? returning that missed call left on your answering machine - after someone took the time and effort to contact your business with an enquiry, how long does it really take to acknowledge and appreciate the interest they might have in your product or service? creating that special webpage (or fixed page on a blog) where new subscribers to your tips, newsletter or free leaflet end up on instead of AWeber's default page - after your website visitor, blog reader has given you his/her name and email address out of trust, how hard is it to make that simple effort so they can read in your own words what is going to happen next and start the conversation right there? typing out a specified quote for a prospect that visited our showroom - after they drove all that way to see our products and already are on our newsletter list so we have their email address, how long does it take to fill that template in our CRM system with all materials needed specified so they don't have to guess what those handwritten scibbles on our "on-the-spot-quote" form really mean? - even I can't encipher my own handwriting after a day, let alone my prospects! A tiny effort which adds great value to the interaction, conversation, business building. There is a fine line between personalised and generalised messages - cross it at your own peril! At the end of next week we are leaving for a 'work' holiday to The Netherlands. Besides the annual family dinners and visits to our suppliers in our home town we are also going to visit (finally, the invite has been offered almost a year ago) our design parquet manufacturer in the more Eastern part of our home country and add a few days to go 'site-seeing' in that area. So we are away for a longer period than we normally are (4 days is mostly the top end of our 'holiday' time). Since I prefer to have our phone answered by a real person during our own absence I'd asked a friend about a company I knew he knew could provide an answering service. A day after I emailed my friend this company called me to discuss our 'needs'. What we wanted - just one week of 'taking-over' and hopefully managing to direct callers to an appropriate page of our websites to find more information or to list urgent messages for us to return the call by mobile phone - was not what they standard offered. But he would put together a proposal for us - based on our requirements - email that straight over and give me a call back a day later. At the end of that day his proposal arrived in my inbox - attached to his email was a professional prepared proposal that looked the 'part' - company brochure type of cover, you know the thing, in PDF form. The cover was personalised: Presented to my name and our company name. Now we all know how effective a personalised message can be. Addressing someone by name instead of "Dear Sirs" is very simple nowadays with any proper Contact Relationships Management Program. First page of the proposal talked about them (not good). Then on page 5 of the proposal I started to feel (tongue-in-cheek) insulted! Just so that we are proposing the right solutions for your organisation, we have identified and set out below the problems that you are currently experiencing. You know, I couldn't even be bothered to read their solutions for our specific needs. If there is one thing our company is known for is a prompt, quick and efficient reply to any enquiry that comes in - no matter in what form: phone, email, visitor in our showroom. In the event a second call comes in while I'm still engaged with a caller, not only will an answering machine kick in - the phone number of the second caller is logged so even when no message is left we can return the call (if the number is of course not withheld). And re 5 and 6: our business phone is redirected to our home phone after and before working hours! (And answering the phone after 'hours' sometimes gets very surprised reactions: oh, I was expecting an answering machine!). As the title of this post suggests: there is a very fine line between personalised and generalised messages. Not all messages are standard suited for an automated personalised approach - so don't even try (or invest in a software program that does handle all the various options you offer your clients to automate your proposal: see here or here for an example - although the software still in beta-version it works a treat). My solution for our week away - edit the outgoing message of our answering machine and frequently check for messages to return the call. And he never did call back to discuss this "based on our requirements" proposal too! Disability with numbers - for a bookkeeper just plain weird? Every language has its own particular way or method to pronounce numbers. Some go from left to right (80 + 4 = 84), some from right to left (4 + 80 = 84) and some, well lets not call names but it can be very complicated to count in French (4 x 20 + 4 = 84). As bookkeeper and lets not forget my other job: sales person, working with numbers is all in a days work. Nothing special you can say. But.... since I don't know how long I have a problem with numbers. I keep turning them around. Just mention 67 to me and I'll write down 76, 57 becomes 75, 84 turns into 48 etc. Now, our native language (Dutch) reads numbers from right to left: four and eighty makes 84. Could that be the problem? We Westerns read from left to right, not the other way round. So when we moved to the UK 8.5 years ago (time flies when you're having fun!) I thought the problem would 'solve itself': eighty four makes 84 - reading numbers from left to right like 'normal' standard reading of words. But alas. 84 still turns into 48. I always ask callers to spell their phone number digit for digit, I get 'lost' otherwise. I told him I just don't know. I concentrate on getting it right, of course I do, but no matter how hard I think: I have to pronounce this right, I have to pronounce this the right way round... I keep turning it around. I've come up with a trick: imagining the number written down on paper and then almost spelling it out - helps a bit but not always. Being dyslectic - word blind - is a 'common' and recognised disability. I just wondered if there are more 'disabled' bookkeepers like me around who are "number-deaf"?